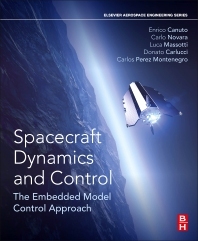 Spacecraft Dynamics and Control: The Embedded Model Control Approach provides a uniform and systematic way of approaching space engineering control problems from the standpoint of model-based control, using state-space equations as the key paradigm for simulation, design and implementation. The book introduces the Embedded Model Control methodology for the design and implementation of attitude and orbit control systems. The logic architecture is organized around the embedded model of the spacecraft and its surrounding environment. The model is compelled to include disturbance dynamics as a repository of the uncertainty that the control law must reject to meet attitude and orbit requirements within the uncertainty class. The source of the real-time uncertainty estimation/prediction is the model error signal, as it encodes the residual discrepancies between spacecraft measurements and model output. The embedded model and the uncertainty estimation feedback (noise estimator in the book) constitute the state predictor feeding the control law. Asymptotic pole placement (exploiting the asymptotes of closed-loop transfer functions) is the way to design and tune feedback loops around the embedded model (state predictor, control law, reference generator). The design versus the uncertainty class is driven by analytic stability and performance inequalities. The method is applied to several attitude and orbit control problems. Researchers and practitioners in the field of control engineering, aerospace engineering, mechanical engineering, and applied mathematics. The detailed exposition of basic topics may benefit students. Enrico Canuto has designed the drag‐free control of the successful European GOCE spacecraft. Recently he has studied and proved the integrated formation, drag‐free and attitude control of the European Next Generation Gravity Mission. He also contributed to conception, design and implementation of on‐ground test facilities for space qualification, among them the thrust stand Nanobalance. He has published several journal papers on the spacecraft control, based on the Embedded Model Methodology, which developed and applied to several applications. He has taught a course on Aerospace modelling and control at Politecnico di Torino. Carlo Novara is an Associate Professor at Politecnico di Torino. He was a visiting researcher at the University of California at Berkeley in 2001 and 2004. He is the author or co‐author of about 100 scientific publications in international journals and conference proceedings. He has been involved in several national and international projects and in several research contracts in collaboration with Italian and European companies. He has worked for more than 15 years in the fields of nonlinear system identification and control and, recently, he is bringing his experience in these fields to the aerospace sector. His current research interests include satellite attitude, drag free and formation control. He is teaching a course on Aerospace modelling and control at Politecnico di Torino. Carlos Norberto Perez Montenegro is postdoctoral research assistant at Politecnico di Torino, Italy. His research interests include automatic control algorithms on different platforms, use of programming environments for microcontrollers, programmable logic controllers (PLC), inter alia. Luca Massotti received the Laurea degree in Aerospace Engineering from the Politecnico di Torino (Turin, I), in 2000, and the Ph.D. in Aerospace Engineering from the Aeronautical and Space Department of the Politecnico di Torino (Turin, I), in 2004. In 2001-2002, he was visiting researcher at West Virginia University (WVU, US) to study aircraft modelling and Neural Network controllers. After the Ph.D. degree, in 2004 he joined Thales Alenia Space in Turin (I) as an engineering consultant for metrology and AOCS. From 2005 to 2007 he was a Post Doctoral Researcher at the Earth Observation Programmes Department of the European Space Agency (ESA) at ESTEC facility, in The Netherlands. He is currently a consultant at ESA/ESTEC, Earth Observation Programmes Directorate – Future Missions division, with Rhea B.V. since 2007. He is the author of co-author of more than 80 scientific publications in international journals, conference proceedings and articles on books. He has been working on European projects of Earth Explorers satellites (in particular on Biomass, selected as Earth Explorer 7, and FLEX, selected as Earth Explorer 8), GEO High Resolution and GOCE follow-on missions. He is actively involved in the ESA Technology Research Programme, either in the preparation or the review phases, in the domain of micro-propulsion, laser metrology and AOCS. He has been appointed as coordinator of the Inter-Agency Working Group between ESA and NASA on gravity topics, and he is actively involved with the Center for Gravitational Experiments in Wuhan (China). His research interests cover aircraft & satellite modelling and simulation, nonlinear and adaptive control design, artificial intelligence techniques (NNs), Nano-balancing, AOCS, Drag Free and Attitude Control for scientific satellites. Dr. Massotti is a Member of the AIAA GNC Technical Committee, Senior AIAA Member, and lecturer at several universities and research centers (e.g. Giessen University (D), Politecnico di Torino (I), FOTEC (A) and HUST University (China)).